Laguna Honda Lake: PUC promises broken? The comment below (on May 13, 2010) was the first we knew of what was happening by Laguna Honda Lake, just off the bottom of Clarendon Avenue. “Do any members here have photos of the Laguna Honda Reservoir from a few years ago? Specifically, photos that capture the area along Clarendon Ave, to the East of the reservoir? “The PUC just installed a large (8′high x 6′ wide) circuit breaker at sidewalk level, just inside the gate on Clarendon. They will build a 20 x 20 office on the site, unless we act NOW! In addition, they just informed us that the site will be used as a permanent distribution center for gravel and dirt for City repairs! (See the piles of gravel there today – the PUC wants to keep them). “Four large, healthy trees were removed to install the circuit breaker and a large patch of flowers and bushes was paved over to make room for the gravel piles. With all of the other existing buildings and paved areas in The City today, it makes no sense for the PUC to destroy green and open space in a residential area. “Please post any photos of the area you may have to help us illustrate the beauty the PUC has just destroyed. Driving by there, we feared it was already too late, until we saw an item in today’s San Francisco Chronicle. They noted that the PUC had taken 2500 square yards for use as a staging area for work on nearby pump stations. At the time, the PUC promised to return the area to its original green state. PUC held a meeting in April, attended by about 30 unhappy neighbors. Another meeting was this evening at the Clarendon School. We couldn’t go, since we were at the UCSF Sutro Forest Agenda Planning Meeting, but we hope to hear from people who attended, including the President of the Forest Knolls Neighborhood Organization. The opposing neighbors have a website and a Facebook page. The PUC does indeed appear to have a rather cavalier attitude to greenery. Is that what we got? Not so much. Here’s the new pump station soon after completion. All the tall trees and dense greenery that screened Forest Knolls from the Aldea Student Housing are gone, and there’s no space to plant more. The huge gap in the trees looks to be permanent, though the brown areas in front of the Pump Station are greening out. sad, they took out a lot of trees and painted it in brown tones? The Forest Knolls Pump House project? 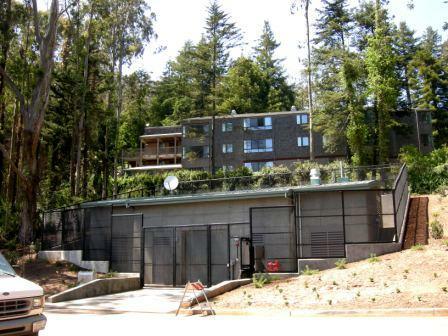 Yes, they certainly took out a lot of trees – both above the new Forest Knolls pumphouse, and on a different part of the slope where there’s a cut in the forest straight up to the water-tank on UCSF land. The brown/gray is the original color of the concrete. They haven’t painted it, I don’t know if or when they will. They’ve planted six saplings in front of the pumphouse now.